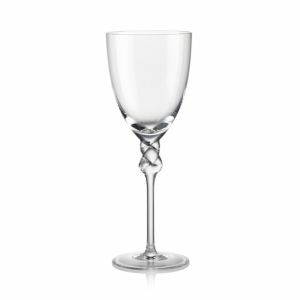 Crystal stemware from Europe for elegant tables. This Italian-inspired highball glass will elevate every cocktail with its handpainted, 14-karat gold design. Decorated with ornate emblems handpainted in 14-karat gold, this elegant dessert bowl will elevate everything from fresh berries to gelato. 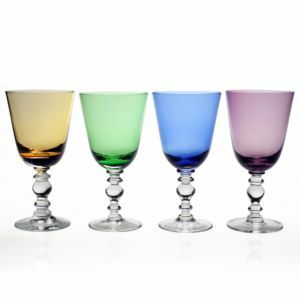 Set of four assorted short tumblers with prism design. Made of glass. Made in Italy. Set of four assorted tall tumblers with prism design. Made of glass. Made in Italy. 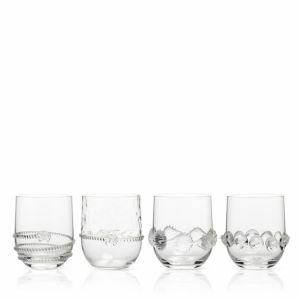 Set of four highball glasses. Crafted of nonleaded crystal. Dishwasher safe. Set of four goblets. Non leaded crystal. Dishwasher safe. Set of four double old-fashioned glasses. Crafted of nonleaded crystal. Dishwasher safe. Designed for everyday living, Marquis by Waterford offers exceptional style at an exceptional value. Markham lends an air of sophistication to any event, with stemware featuring a classic cut pattern design and sculpted stems. Sets of four glasses. A true British classic, Botanic Garden was designed by the celebrated designer Susan Williams-Ellis using early 19th century illustrations as her inspiration. Botanic Garden's delightful mixture of floral motifs and signature leaf border set a new trend for casual dining when introduced in 1972 and is just as stylish today. Brighten any table with this set of Botanic Garden Highball Glasses from Portmeirion, featuring four pretty floral motifs that complement a variety of dinnerware styles including the rest of the Botanic Garden collection. A true British classic, Botanic Garden was designed by the celebrated designer Susan Williams-Ellis using early 19th century illustrations as her inspiration. Botanic Garden's delightful mixture of floral motifs and signature leaf border set a new trend for casual dining when introduced in 1972 and is just as stylish today. Crystal wine glass. Simplicity crystal water goblet. Holds 9 ounces. Crystal. Flat cut pattern. Crystal champagne flute. 10"T; holds 4 ounces. Clear crystal flute engraved with springtime creatures. 8.75"T; holds 4 ounces. Clear crystal flute. Handcrafted wine glass features a mix of engraving techniques. Raspberry and clear crystal. 8.25"T; holds 6 ounces. Clear crystal goblet. 7.5"T; holds 9 ounces. Clinking glasses never sounded better! The thicker glass and classic lines of this drinkware offer luscious texture and a substantial feel for everyday elegance. Chic with Juliska's signature berry and thread medallion, it makes a timeless addition to an everyday glassware collection. Glasses with ribbed details. Crafted of glass. Dishwasher safe. 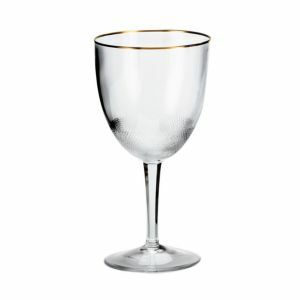 Double old-fashioned, stemless wine glass, wine goblet, and highball sold individually. Glass. Clear acrylic goblets, sold individually. 3.25"Dia. x 6.5"T; holds 12 ounces. Dishwasher safe. Acrylic drinking glass. Holds 18 ounces. Dishwasher safe. Clear glass goblet. Dishwasher safe; hand washing recommended. Made in the Czech Republic. Featuring an array of signature Juliska motifs, this hand-blown collection creates a lustrous display for your table or cocktail hour. Glass pitcher. Holds 1.5 quarts. 7.5" x 5.5"D x 10"T. Dishwasher safe. Four piece assorted set of glass tumblers. Each holds 8 ounces. 3"Dia. x 4"T each. Dishwasher safe. Inspired by the chic London neighborhood for which it was named, Wedgwood Knightsbridge stemware features a delicately round shape with deep cuts around the bowl, accented with a platinum rim. The stem resembles a flower when viewed from above Handcrafted. Glass bowl; pewter stem. Delicate hand-blown crystal is detailed by hand with dozens of diamond cuts, then edged with glittering 24K gold to create this refined Moser collection A simple love-knot design accents this charming mouth-blown crystal stemware from Rogaska. Each piece is artfully cut and polished by hand. 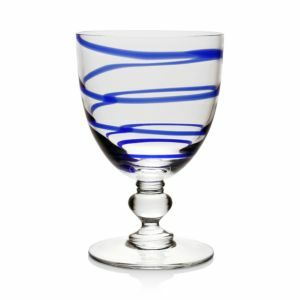 William Yeoward Crystal's Bella Glassware Collection is marked by a single spiral design in white or blue. These elegantly playful pieces bring a chic element to any dining space. 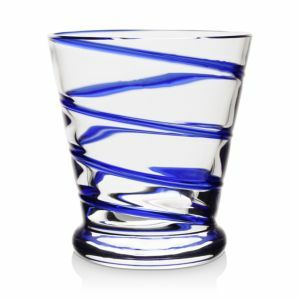 William Yeoward Crystal's Bella Glassware Collection is marked by a single spiral design in white or blue. These elegantly playful pieces bring a chic element to any dining space. William Yeoward Crystal's Bella Glassware Collection is marked by a single spiral design in white or blue. These elegantly playful pieces bring a chic element to any dining space. Handcrafted glass water goblet and wine glass. Handcrafted glass water goblet and wine glass. Handcrafted stemware. Handmade crystal. Handmade glass. Handcrafted red wine glass. 9.25"T; holds 20 ounces. Handmade glass. 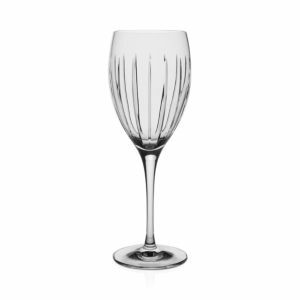 Absolutely dazzling in Waterford crystal, Carina Essence stemware is a tasteful accompaniment to every formal occasion. 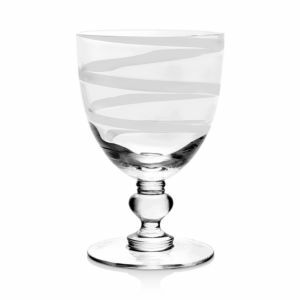 A cut linear pattern extends from the bowl of each glass in timeless splendor. Balancing a graceful design with dishwasher-safe durability, Waterford's Ballet Ribbon Essence stemware collection guarantees an extraordinary table. A platinum rim and etched twirl motif echoes the elegance of dance in magnificent crystal. 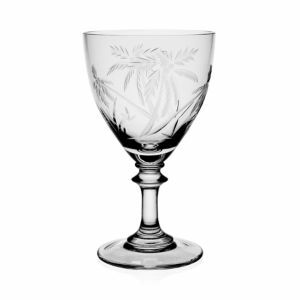 The Araglin pattern is one Waterford’s most popular and traditional, in brilliantly-cut clear crystal.